Meteorite Recon | Meteorites of the Southern Provinces. Expedition to Southern Morocco and Western Sahara, 2012. 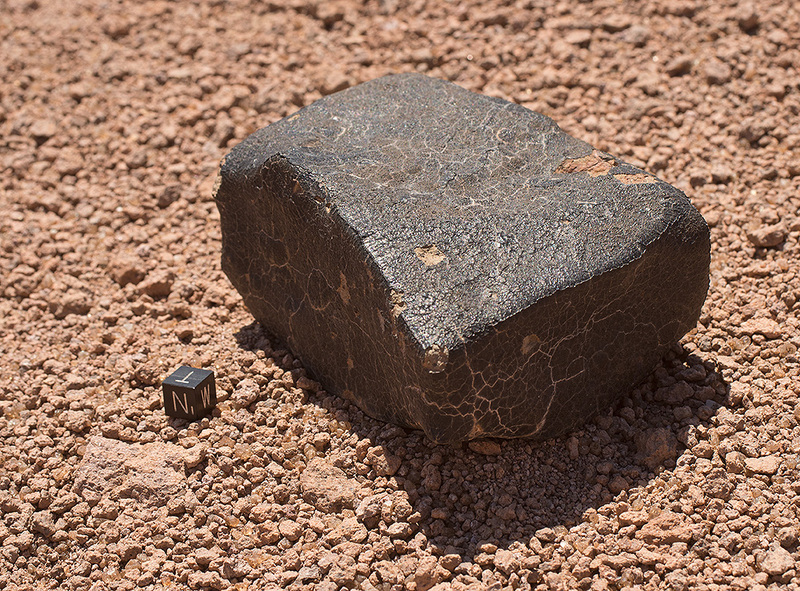 Meteorites of the Southern Provinces. Expedition to Southern Morocco and Western Sahara, 2012. 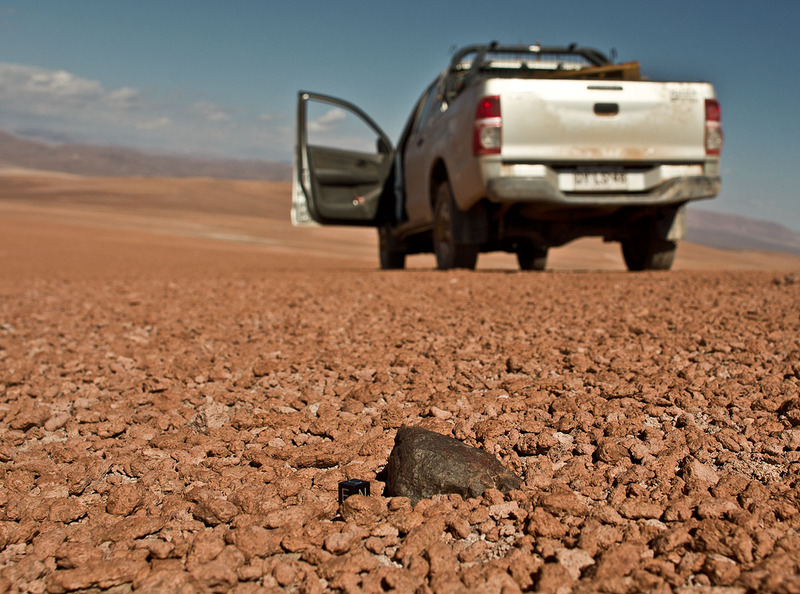 Meteorite searching, meteorites, desert, Sahara, Saquia al Hamra, Spanish Sahara, Bou Kraa, Dakhla, meteorite expedition and photography, Expedition, Southern Morocco, Western Sahara, 2012. “That can’t be true” I was convinced. The rock he wanted me to stop for had written terrestrial all over it. I dismounted to see what this was about. 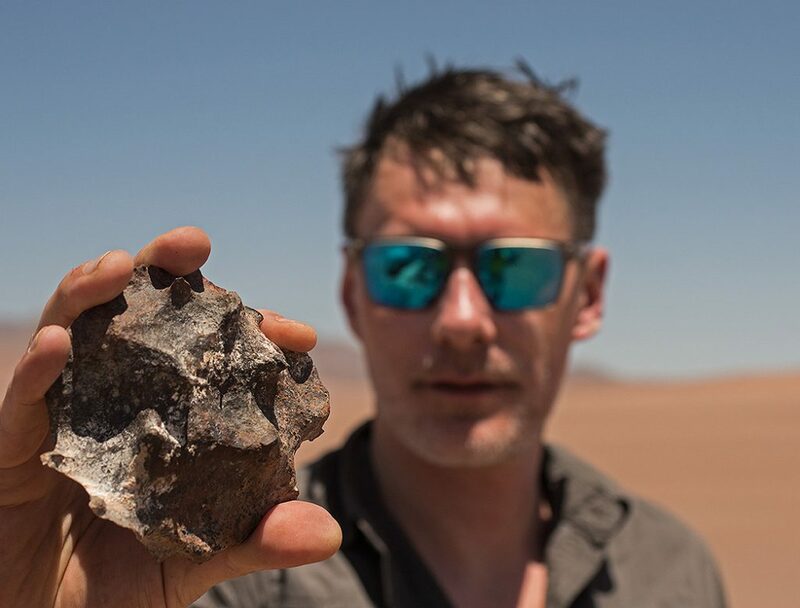 And indeed, Thomas’ rock was terrestrial, but two meters next to it, hidden from the line of sight from the car, was a meteorite, and a big one of several kilos at that! Thomas had only discovered it after he had himself convinced that his initial target was not a meteorite, and then, following his habit of aimless wandering, had literally stepped on the real thing. I congratulated him, and I had to truly admit, that my companion’s approach, which I had secretly dubbed the “Chinese water torture,” had eventually been successful. From now on, I took the frequent stops with serenity. Some time later we spotted a white marker pole in the distance, which on approaching turned out to mark an abandoned drill site. Some worker had the courtesy to discard a wooden pallet at the spot, which we loaded and tied to the truck bed as a welcomed addition to our dwindling supplies of firewood. There was also a large wooden beam, but we agreed that the pallet was sufficient and left the beam for others. It worried me that I had not made a find myself for more than a day now, but when the sun sank in the afternoon and the snow-capped peaks of the Andes became drenched in the golden light, I forgot about that and relaxed. There was hardly a more exhilarating search ground to imagine. The sky had developed into a pattern of milk white clouds which stood out in stark contrast from the intense blue of the sky. 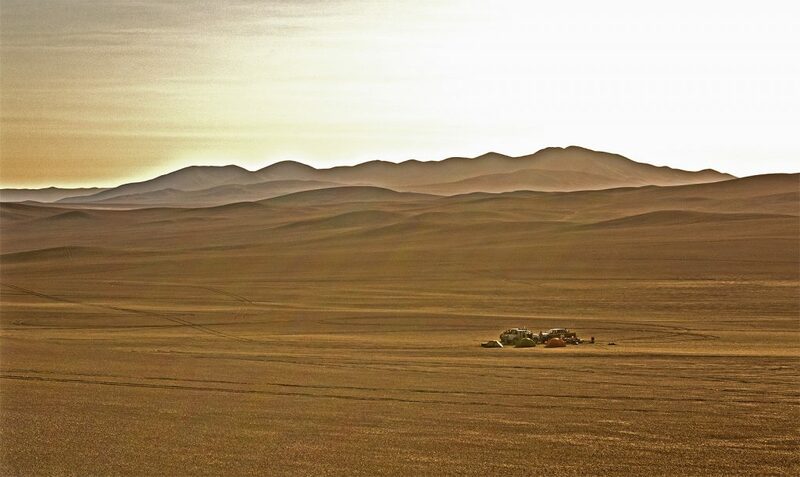 Far in the east, one of our other vehicles was searching, followed by an ochre wake of dust. The rolling orange hills stretched to the horizon, and although there clearly were no meteorites to be seen far and wide … wait. A slightly darker spot right next to a pair of tracks had caught my attention. Could it be? As we were ascending a steep slope, I first had to find a level place to park, before I could get out. Half protruding from the pediment and camouflaged with bright clay dust was a dark brown chondrite, the size of a potato. “Strike!” I called to Thomas, who hurried to join me, apparently happy that his grumpy driver had not only found a meteorite, but apparently also rediscovered his inner balance. When Marc and Andi showed up at the evening camp, they had not only brought a dozen sample bags filled with meteorites, but also the four meter long beam, which they had sawed into a number of neat logs by using Andi’s Fiskars saw. They must have found the drill site shortly after us. Given the vastness of the area, it was astonishing how we all came by the same spots. 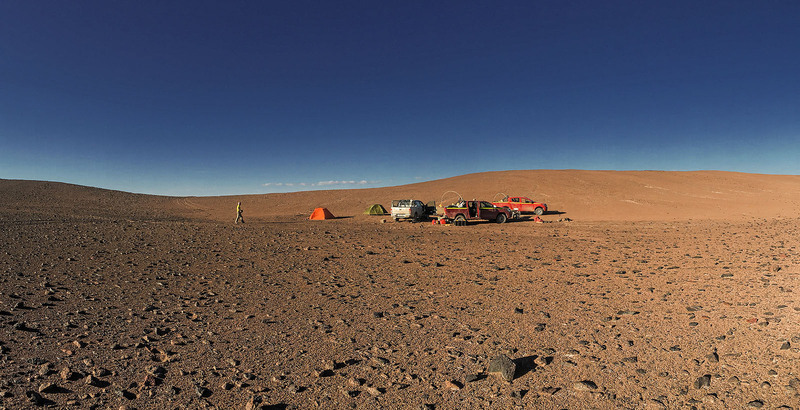 Their three-man team was working on a plain in the pre-cordilleras, up near Calama. Sergey drove errands and used his spare time to search from the car. One day, they were on the way to a new area and at some point, they encountered a pipeline that intersected a wide plain. “The pipeline went on for many kilometers. You could see it from one horizon to the other.” As there was no overpass, Sergey decided to follow it, trusting that there would be a crossing sooner or later. “You know these things,” he gestured, “there’s always a way, somewhere.” They had been driving along the pipeline for twenty minutes or so, when in the distance a red pick-up appeared, similar to their model. “Hello, I am Sergey” replied Sergey. “Hello, I am Miguel” said Miguel. “Do you speak English?” Sergey asked. Miguel seemed to understand and nodded. “I’m here, watching pipeline” Miguel gestured. Sergey nodded. “Meteorites good!” smiled Miguel, showing a thumbs up. “Pipeline good!” Sergey returned, repeating Miguel’s gesture. The narrow gully that we had chosen for the night camp gave little protection against the wind that had come up in the evening, but the next morning all was calm again. When I joined the breakfast table, a slim figure in underpants carrying a shovel and a roll of toilet paper appeared on the ridge of the next hill and approached our camp. It was Thomas on the way back from his morning walk. Since the camp was in the direction of the rising sun, he walked backwards, so he could look for meteorites. While a detached observer might have been thinking the lightly clad person behaved conspicuously, none of us thought anything of it. Of course one would make best use of the morning light when returning from the toilet. There was no such state as being “off-duty.” Such was the dedication and commitment to the mission that each of us always would be on the lookout for targets. This day we worked for twelve hours, starting at eight in the morning. Our efforts were rewarded with six new finds, two for each car. When I fell into my tent that night I dozed off before one could count to three. Had I known what the next day held for us, I probably couldn’t have slept a wink.